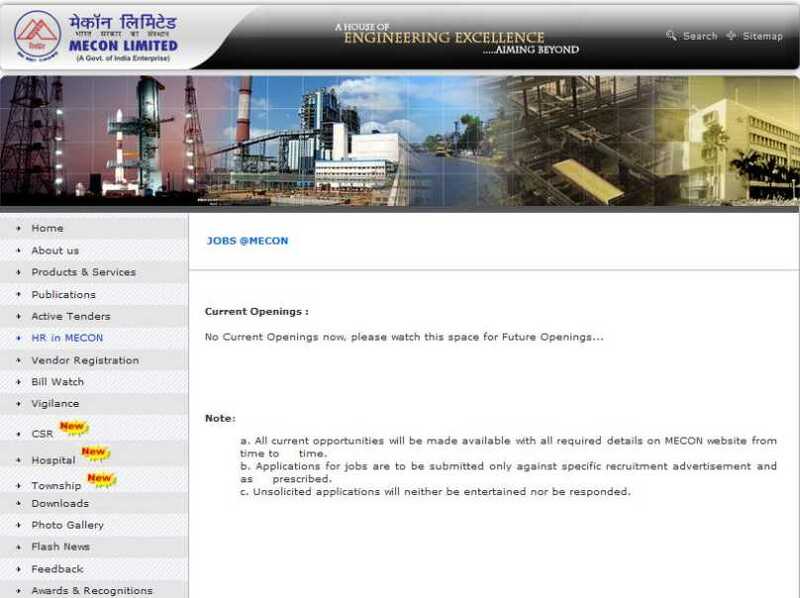 For 2012 what all job vacancies does MECON Limited is going to publish? Is there any central recruitment department at MECON Limited? I have completed my B.Tech. in Material Science now tell me what is the process of applying for job at MECON Limited for 2012 financial year? MECON Limited is at one time known as Metallurgical & Engineering Consultants (India) Limited and it was set up on 1973 in Jharkhand, India. It is a Public Sector under control the Ministry of Steel of the Govt of India. MECON Limited center office is located in Ranchi, Jharkhand. Application form for following post recruitment on through Public Enterprises Selection Board. Interested Candidates may download MECON Limited 2011 application form online on MECON Limited official website and submitted following address. The MECON Limited published recruitment notification for the post of Professional in HR and Professional in Personnel Department in 2011 right now there is no recruitment notification on the website of the company so here I am providing you contact details of the company you can contact it to know about vacant posts. Hello, I am looking for current openings at MECON Limited. Kindly provide me instructions to check its job opening by online. Thanks. MECON Limited, which was formerly known as is a Public Sector Undertaking under the Ministry of Steel of the Government of India. First of all, visit MECON Limited official web page. Where as click on tab named as â€œHR in MECONâ€�. Under new page of careers, click on link named as â€œJobs @MECONâ€�. After clicking on it, you will be landed on its current job opening page. Last edited by Aakashd; August 1st, 2018 at 03:06 PM.